The O+ 360 Alpha Plus 2.0 debuts with bigger RAM and memory! Interested? Check out the rest of the specs here. O+ 360 Alpha Plus 2.0 is now official. The handset is obviously the upgraded version of the 360 Alpha Plus that was released last July. Likewise, it is also the ambassador to the wildly popular Instant Beauty Fix Software which is an engaging tool in taking and processing selfies. The new O+ 360 Alpha Plus 2.0 is the same smartphone that we love. However, the company has tweaked its memory to accommodate the demand of a bigger room for photos and other multimedia files. For one, the 2GB of RAM (up from 1GB) could now enforce faster app launching and smoother multitasking activities. In terms of native storage, the 360 Alpha Plus still packs the 8GB of internal memory but the inclusion of the 16GB SanDisk memory card revved up its overall capacity to 24GB. Aside from the O+ 360 Alpha Plus, there's also a rainpour of memory bumps of other handsets from the company. O+ Ultra and O+ 360 HD now have 24GB. Likewise, O+ 8.38Z Android and O+ 8.96 Android have 16GB and 12GB, respectively. 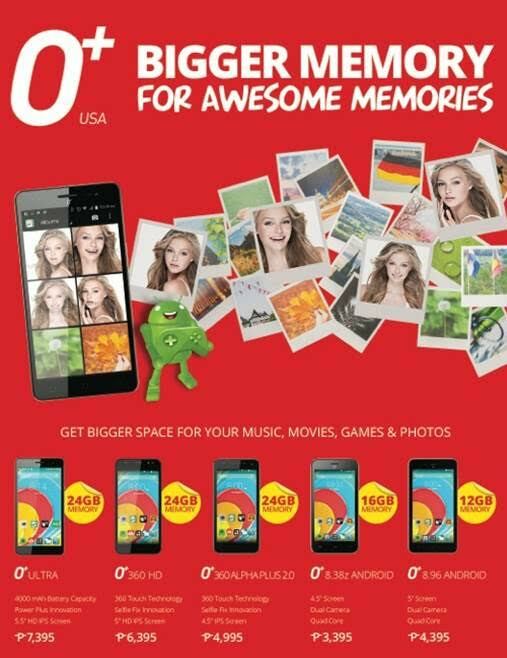 You can now grab the O+ 360 Alpha Plus 2.0 and other beefed-up handsets in all O+ concept stores, studios, kiosks and multibrand stores nationwide.